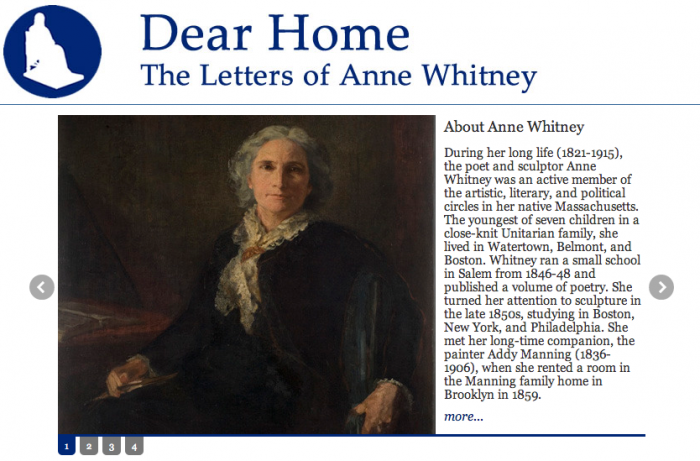 In June 2014, Professor Jacki Musacchio and the Digital Scholarship Initiatives program launched Dear Home: The Letters of Anne Whitney to Wellesley College alumnae. Thanks to funding by the Wellesley College Friends of the Library and their Innovations in Reading and Scholarship Fund, approximately 1000 of the 4000 letters in Anne Whitney Correspondence Collection in the Wellesley College Archive have been presented online for transcription. Transcription is currently open to Wellesley College alumnae. Stay tuned for information about a campus-wide launch with additional letters!